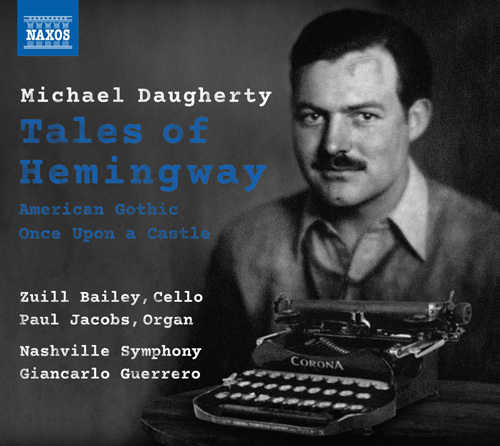 GRAMMY® Award-winning composer Michael Daugherty creates colorful musical portraits in this recording, featuring larger-than-life personalities drawn from 20th-century American culture. Tales of Hemingway is a dramatic cello concerto, evoking the turbulent life, adventures and literature of author Ernest Hemingway. American Gothic is a dynamic concerto for orchestra, reflecting on the creative world of Iowa artist Grant Wood. Once Upon a Castle is a virtuosic sinfonia concertante for organ and orchestra, inspired by the rich history of the Hearst Castle, built lhigh upon the California Pacific coast by billionaire Randolph Hearst, the subject of Orson Welles’ film Citizen Kane. Under the baton of Music Director Giancarlo Guerrero, the GRAMMY® Award-winning Nashville Symphony is joined by Zuill bailey, one of the leading cellists of his generation, and GRAMMY® Award-winning organist Paul Jacobs.